Must the City of Wichita spend its share of Sedgwick County sales tax proceeds in a specific way? Sedgwick County collects a one-cent per dollar retail sales tax. The county keeps some, then distributes the rest to cities. On Facebook, a question arose regarding how Wichita may spend its share of the sales tax proceeds. Couldn’t some funds that go towards building Kellogg be rerouted to, say, fund the operations of Wichita’s public library system? A proposition to enact a countywide retailers’ sales tax in Sedgwick County, Kansas, in the amount of one percent (1%), such tax to take effect on October 1, 1985, pursuant to K.S.A. 1984 Supp. 12-187. The language of the referendum is silent regarding how the tax revenue may or may not be spent. Certificate of canvass, portion. Click for larger. There are, however, other considerations. One, according to Mark Manning, the city’s budget officer, is that the city has borrowed money, with proceeds from the sales tax pledged for repayment. 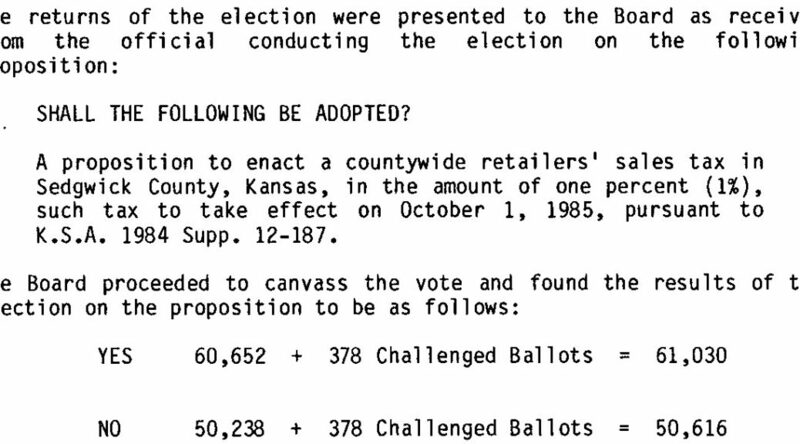 Second, there is a Wichita city ordinance, number 41-185. It pledges half the city’s share of the sales tax towards property tax reduction. 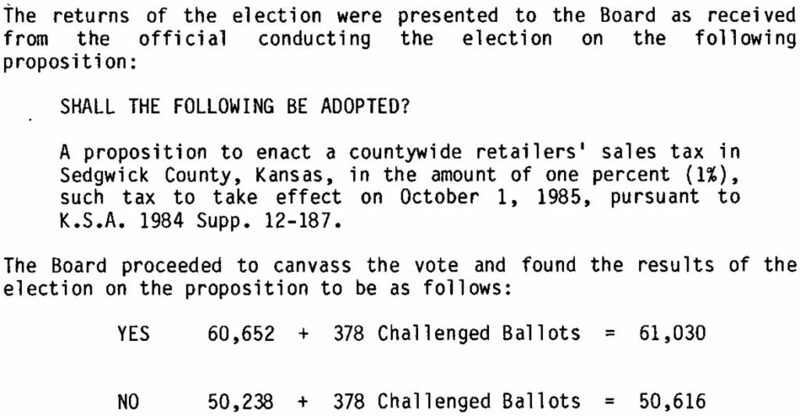 Then, it states: “… and pledges the remaining one half of the one percent (1%) of any revenues received to Wichita road, highway and bridge projects including right-of-way acquisitions.” This was adopted on August 25, 1992 and replaced an existing ordinance that said the same. But really, it isn’t even pledged to that. The pledge is in the form of a city ordinance. It may be changed at any time at the will of four council members. Yes, the ordinance says the city intends to continue using the tax revenues in the same way “as a matter of faith and trust.” Unfortunately, that trust has been destroyed in many ways, one being council members who tell us things that aren’t true.